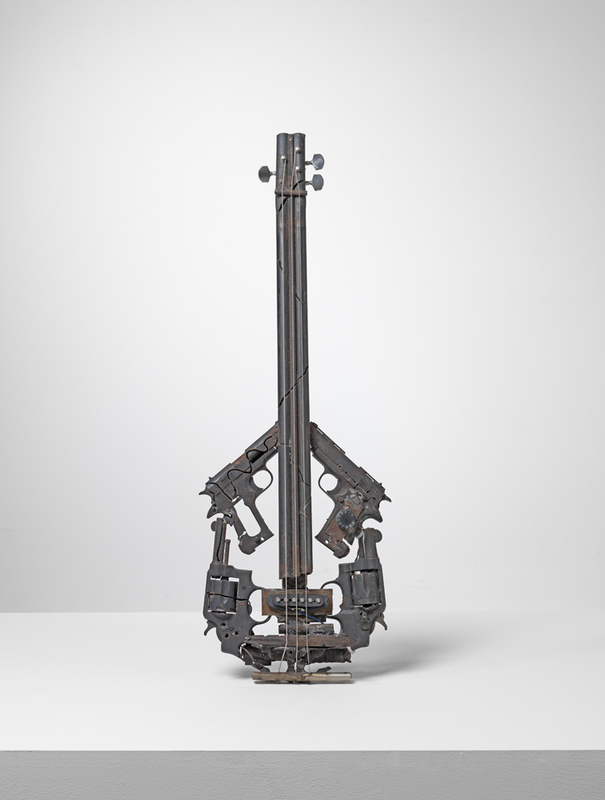 We started planning for Pedro’s exhibition many months before the event – one half of the instruments, the Imagine series, came from the Gwangju Biennale and the Istanbul Biennale; the other half, Disarm series, directly from Mexico. 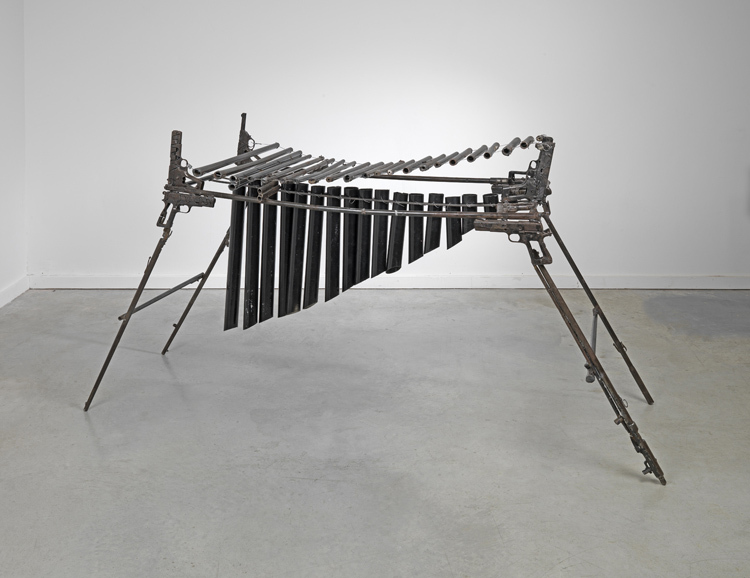 The Imagine instruments were in the UK by January 2013 and we then worked closely with the music producer John Coxon, to produce a record – a limited edition publication for the exhibition. 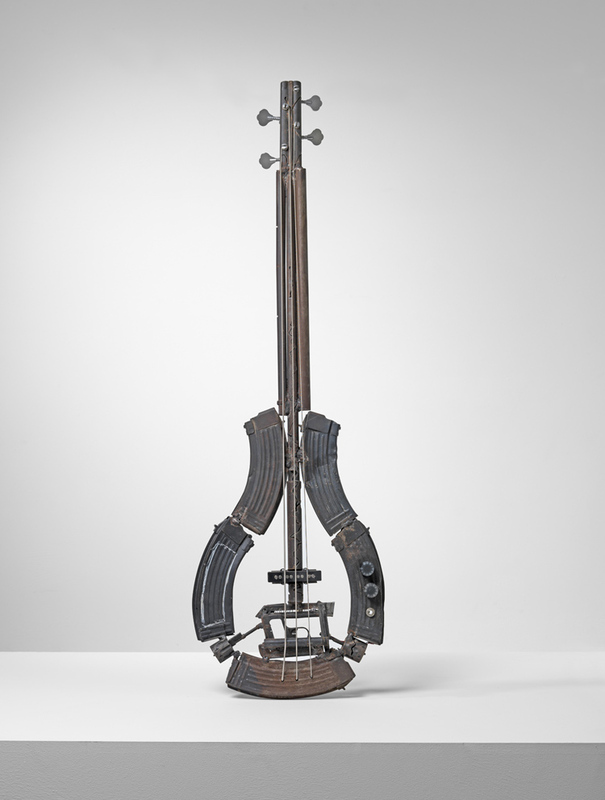 Coxon called in 6 other musicians and they spent a day improvising on the instruments in the renowned RAK studios in central London. 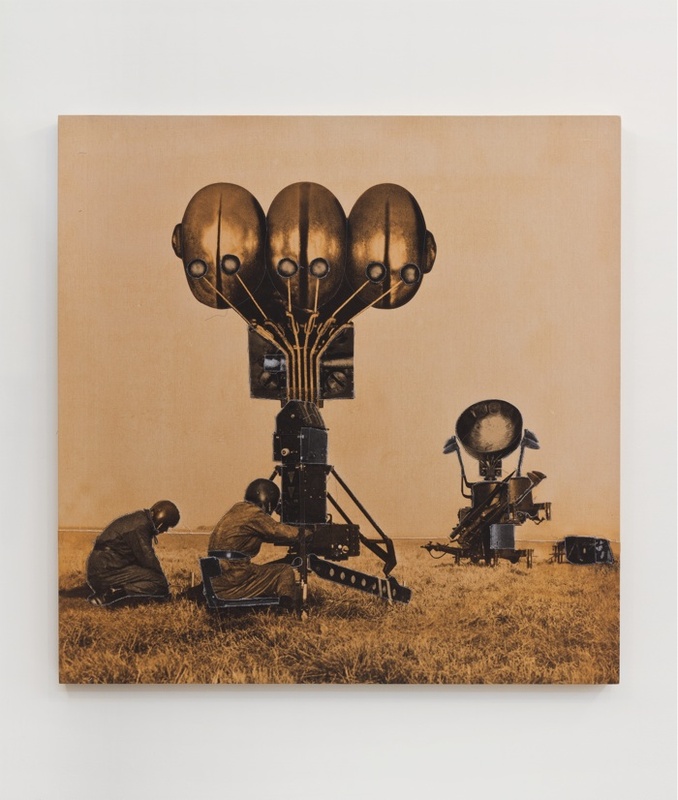 Several weeks later a beautiful Vinyl was produced featuring 12 tracks recorded on that day and album artwork taken from Pedro’s designs. 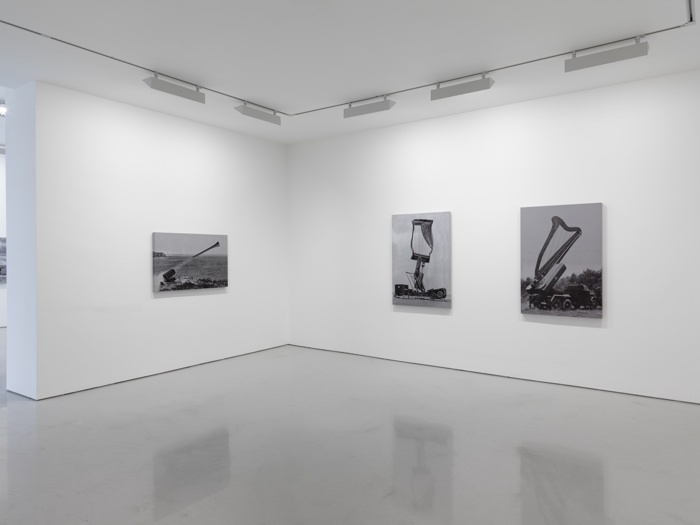 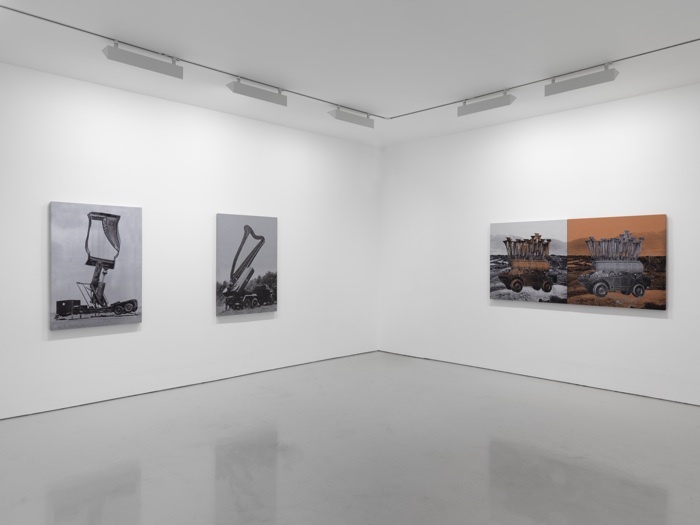 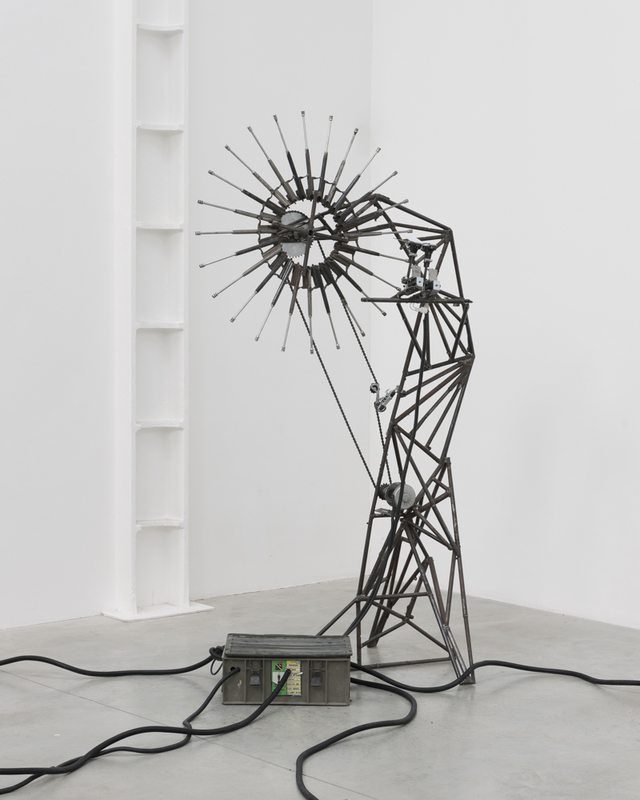 Meanwhile, Pedro Reyes and Lisson Gallery were busy working together on the content of the exhibition itself. 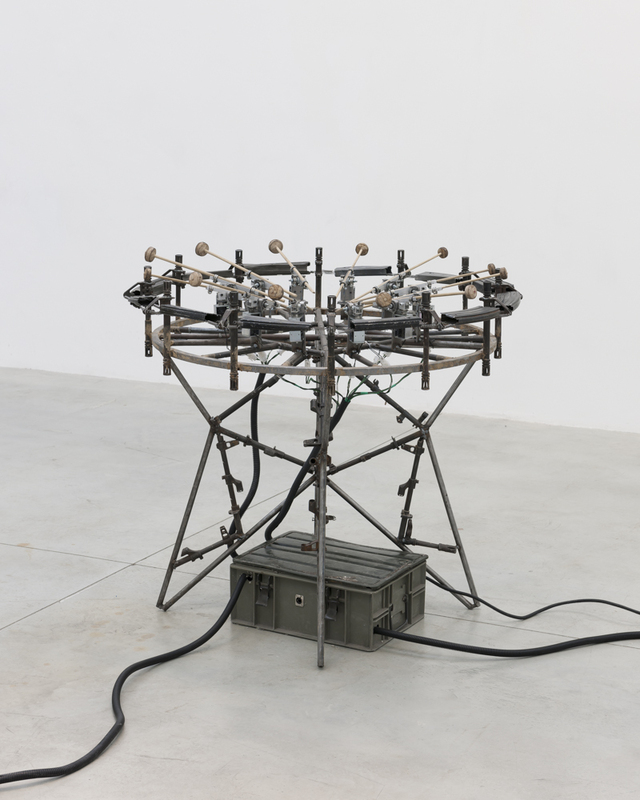 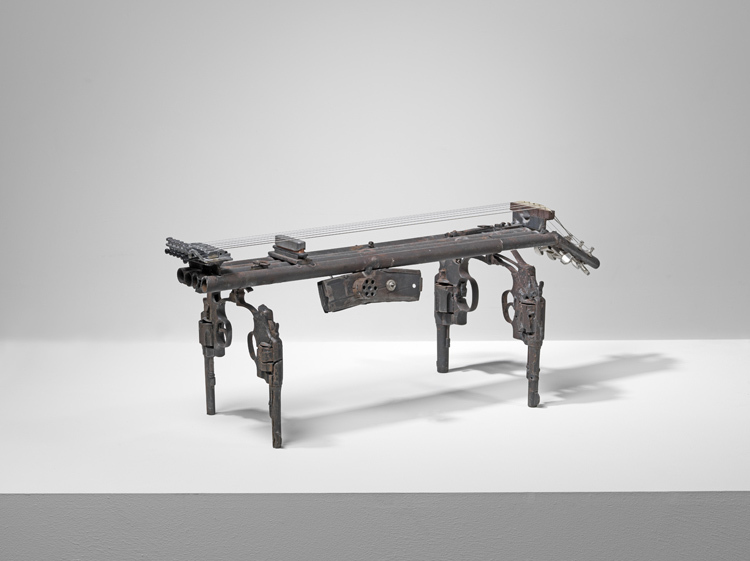 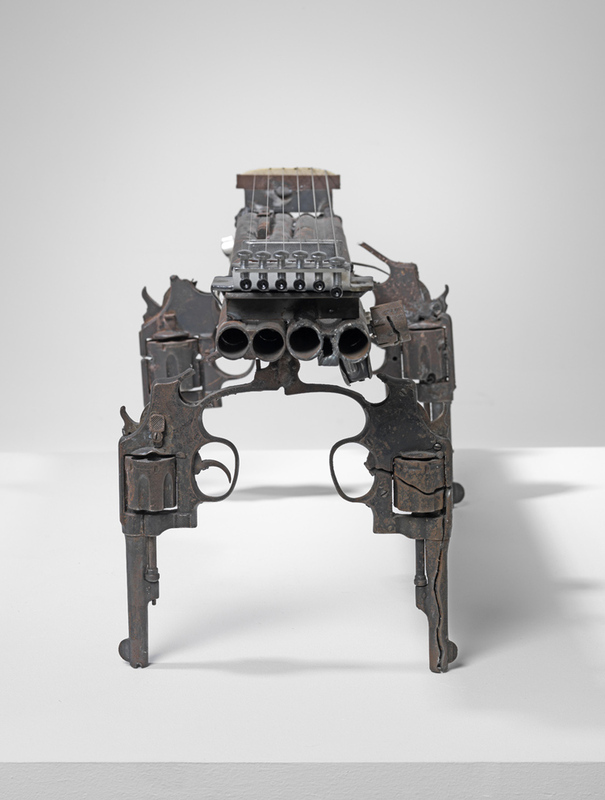 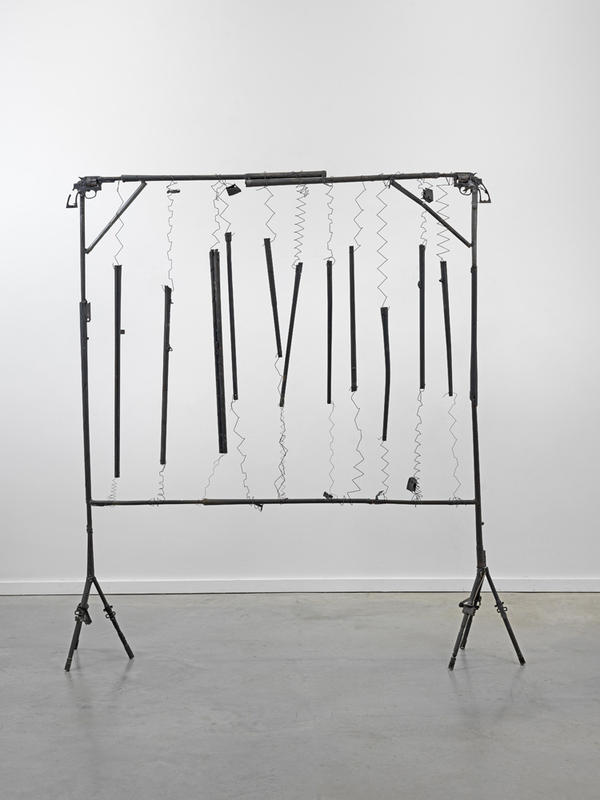 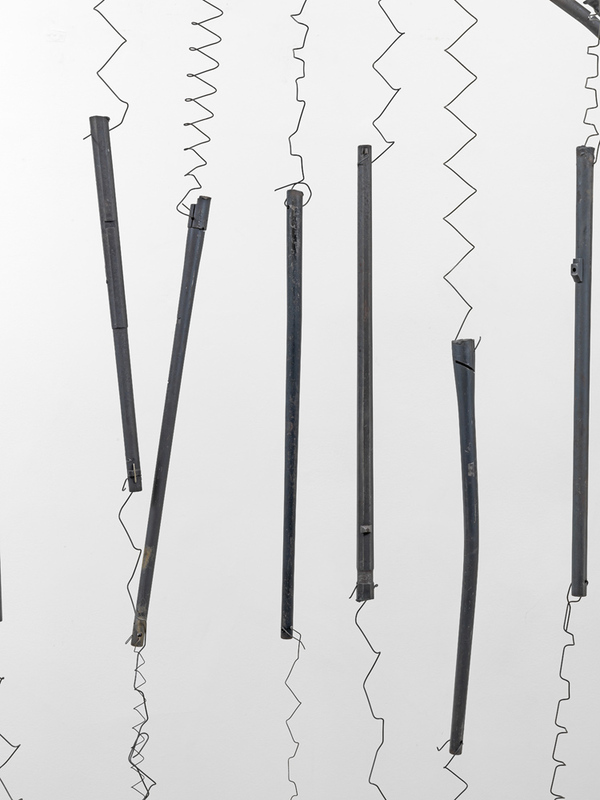 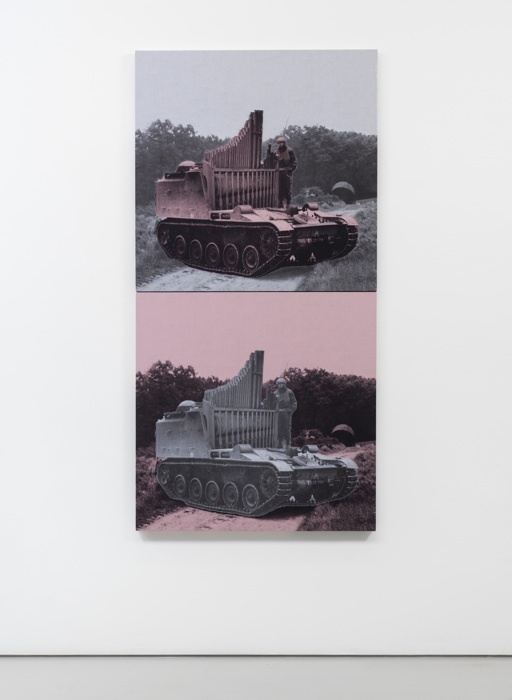 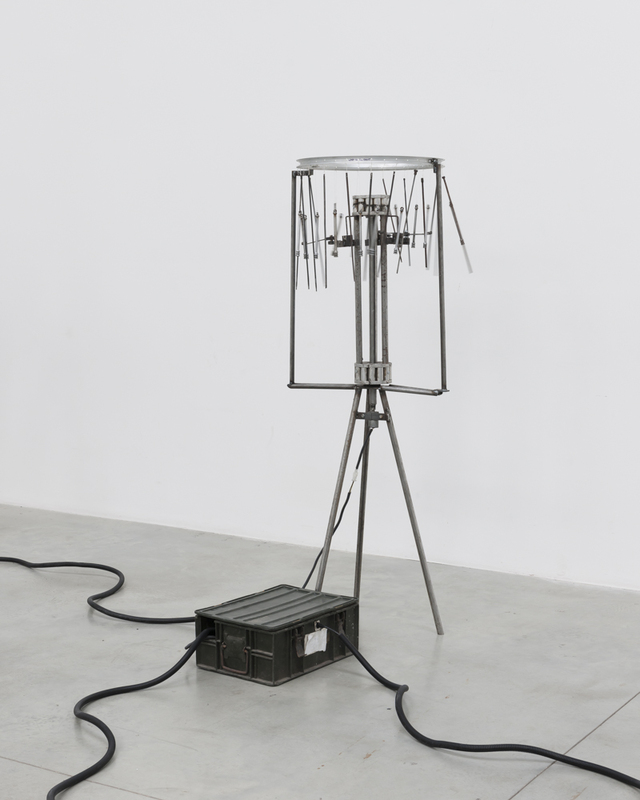 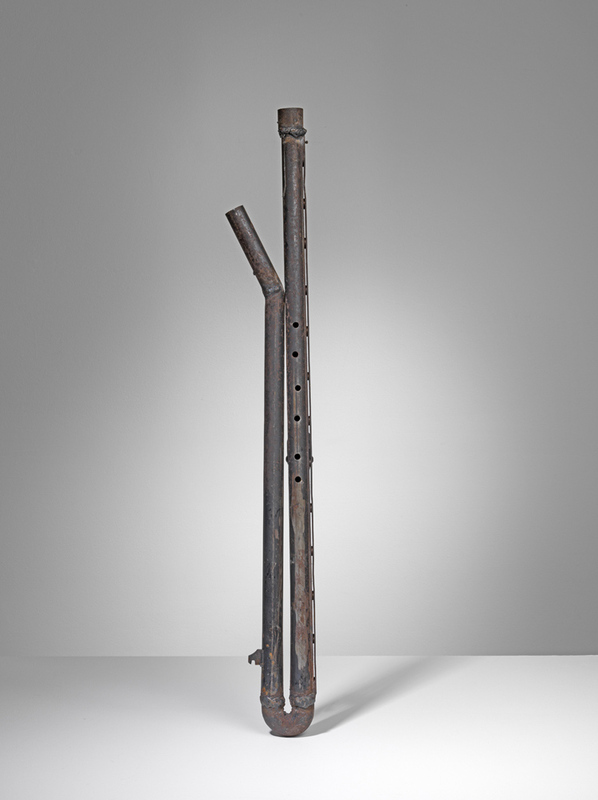 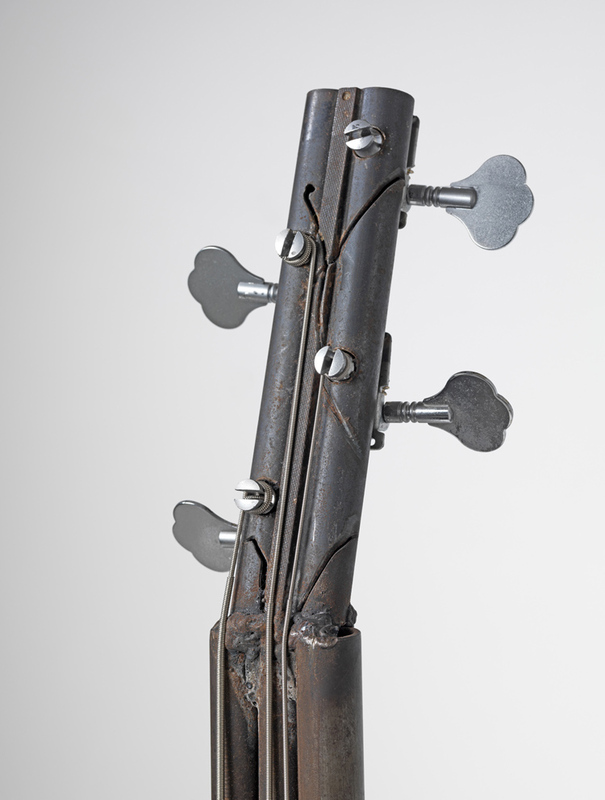 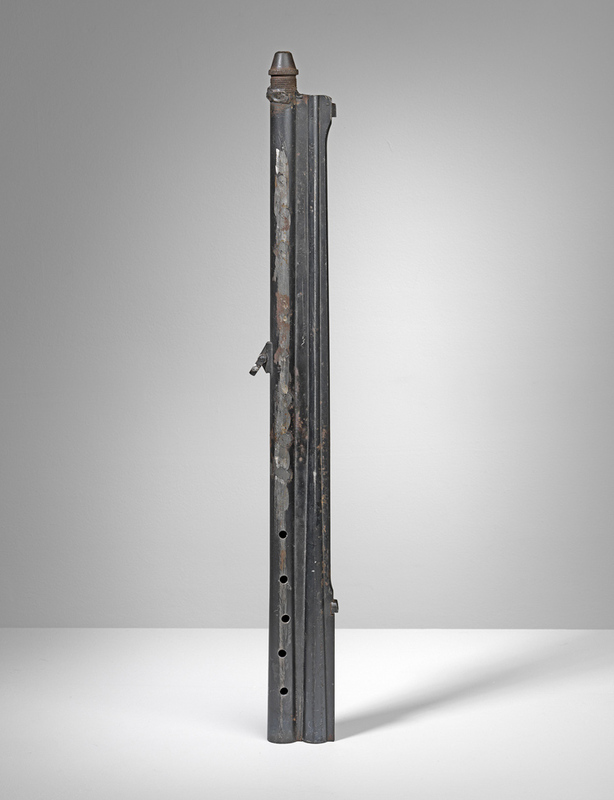 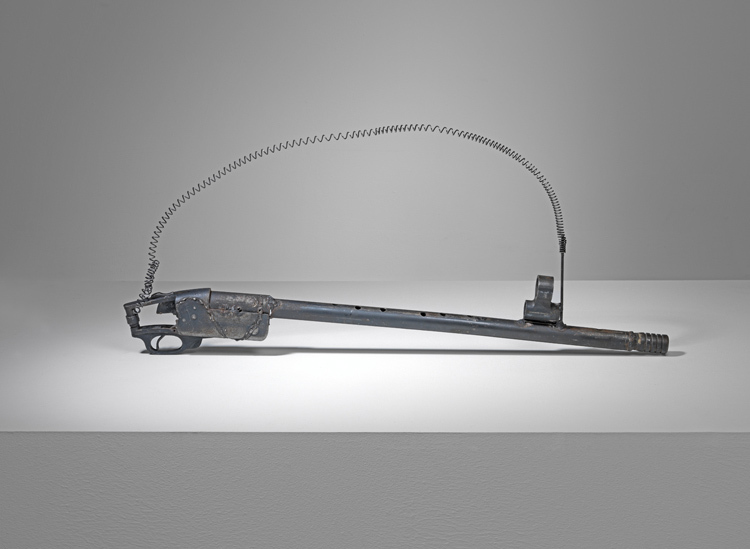 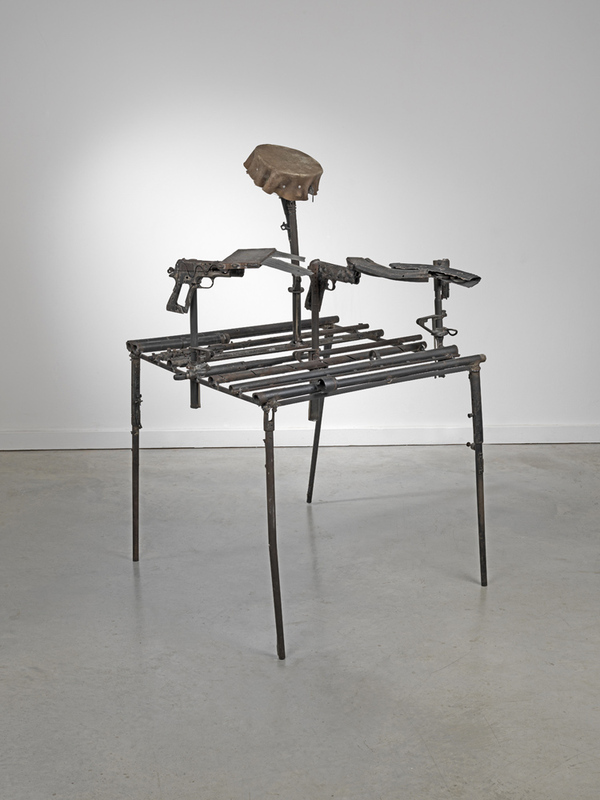 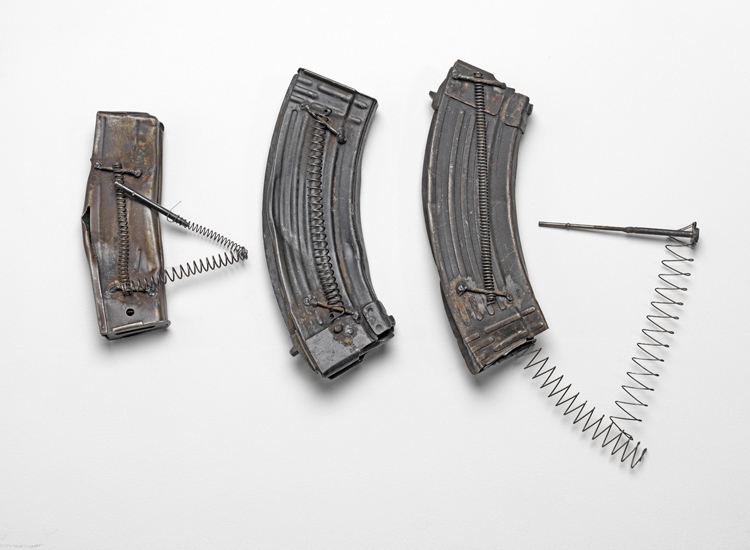 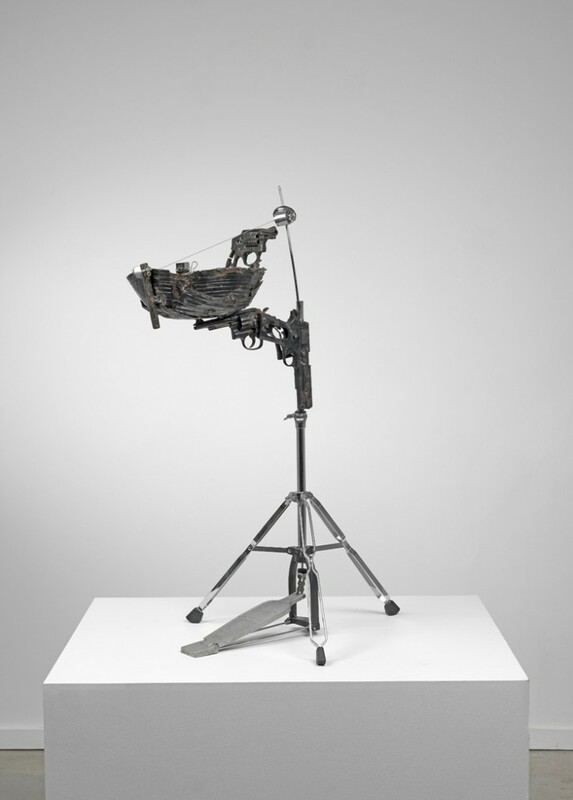 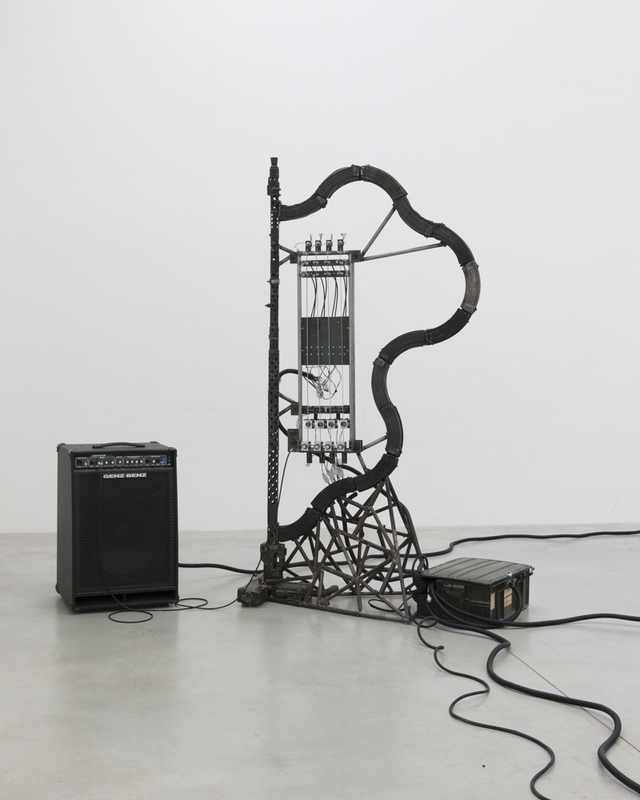 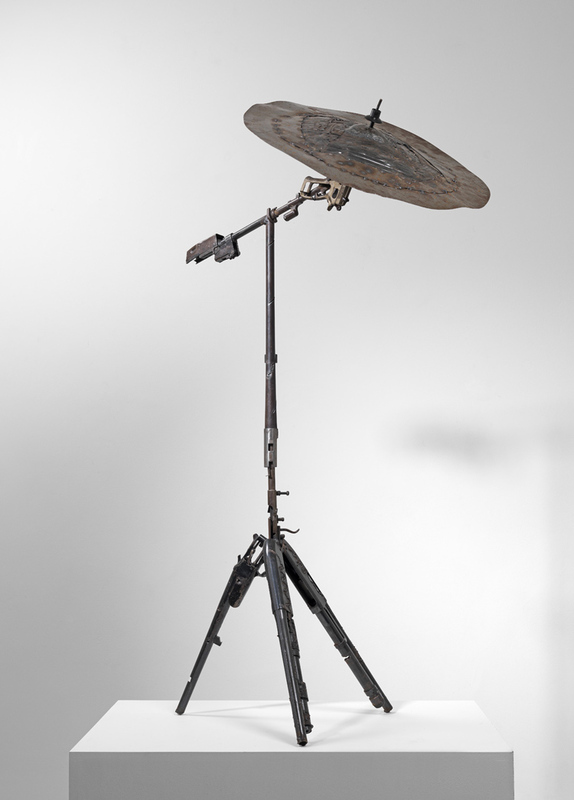 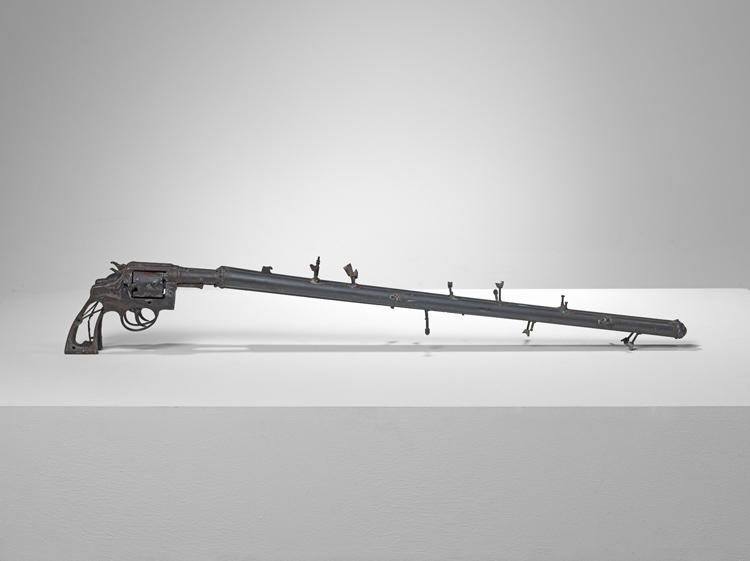 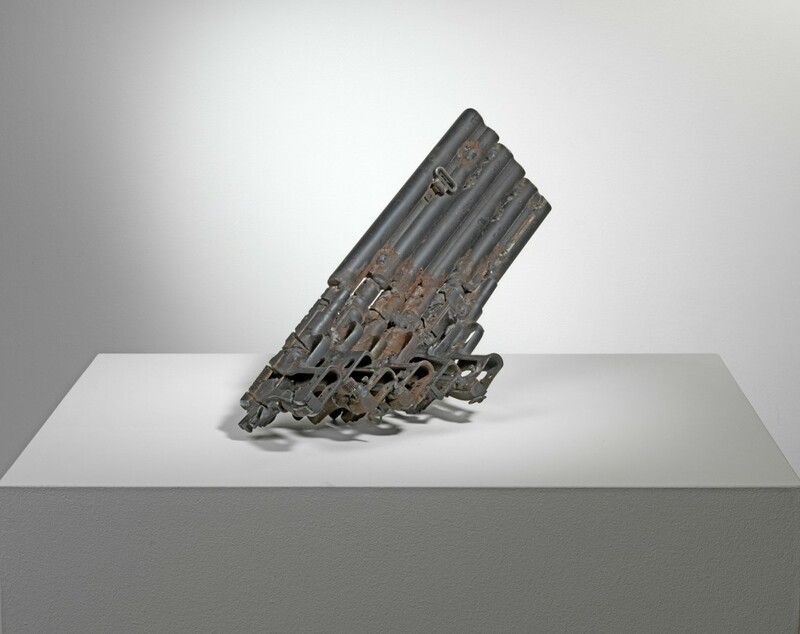 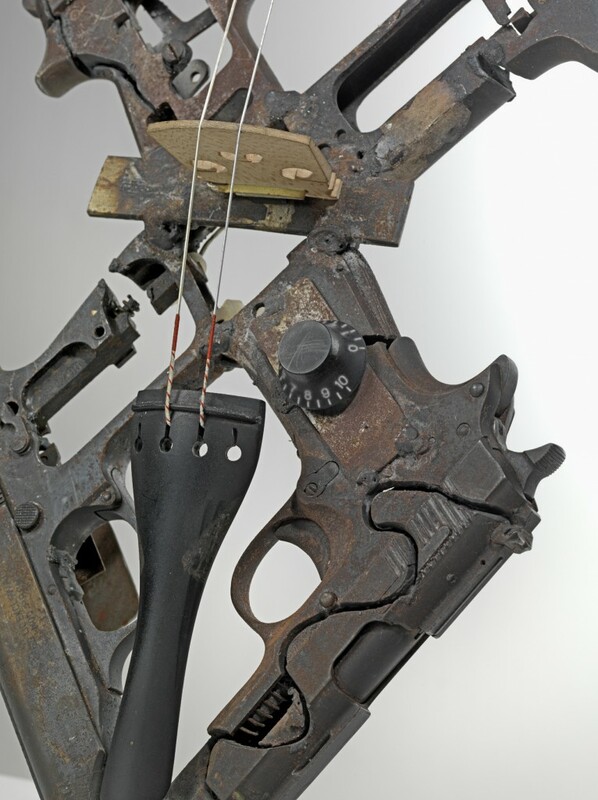 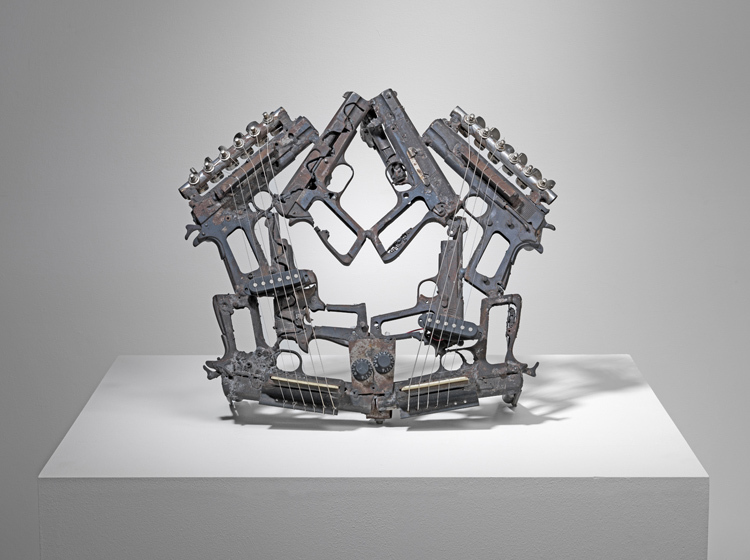 Opening on 26th March, 2013, the exhibition featured 8 Machine Music paintings, 8 Disarm instruments – including a Xylophone, Rain Stick, Guitar, Banjo and Violin, and 9 mechanised Disarm instruments – instruments that would be continuously playing throughout the 6 week exhibition. 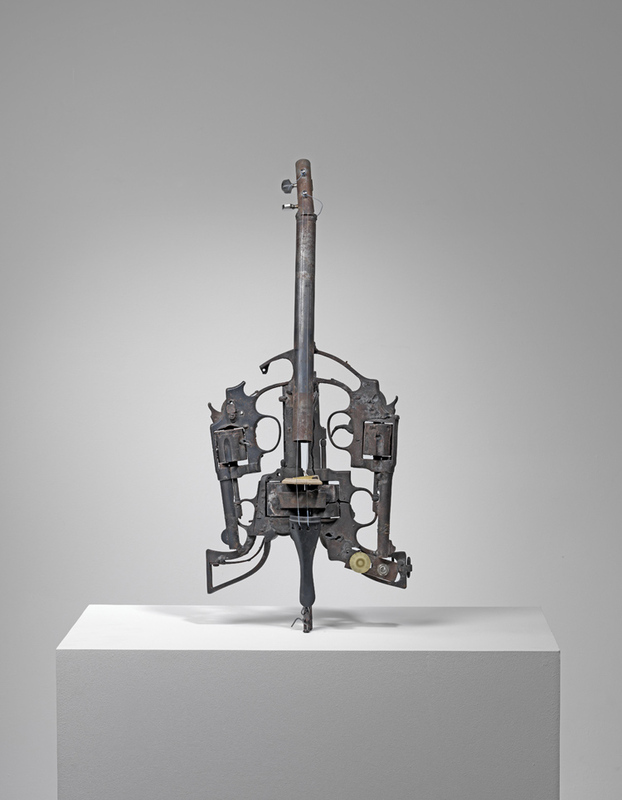 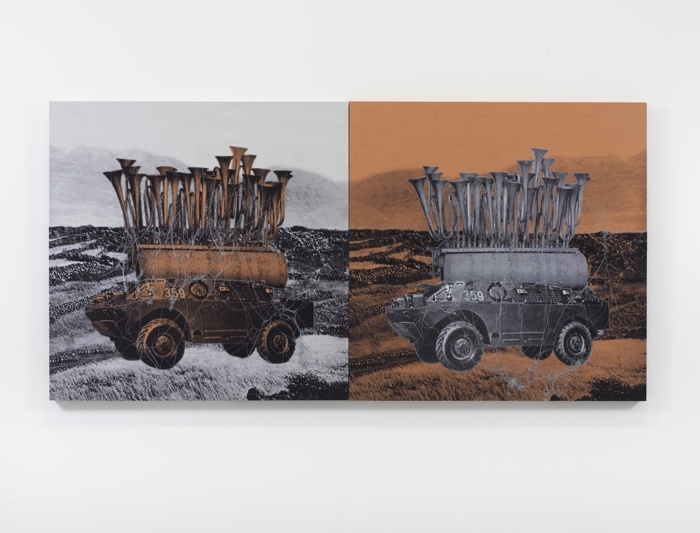 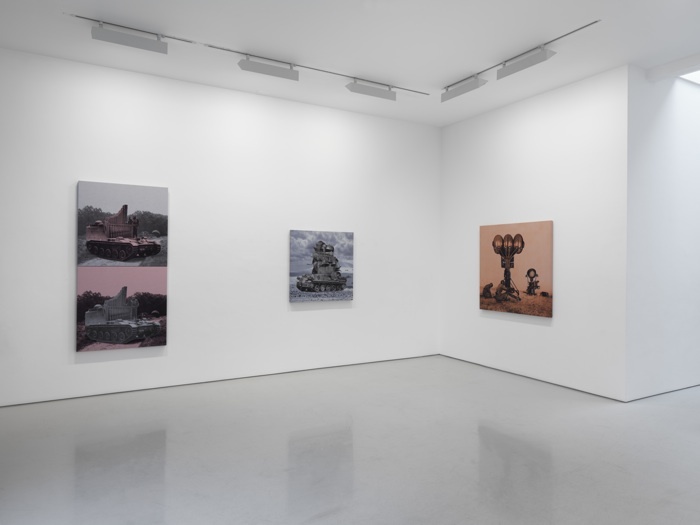 The paintings were in the first two rooms of the gallery, greeting the visitors as they arrive; a fantastic visual mix of musical instruments and war machinery combined in a rich textual composition. 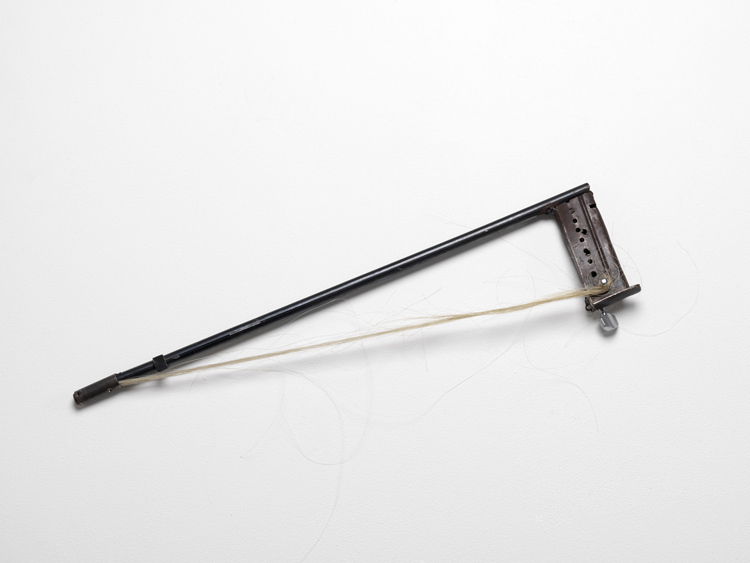 Leading you into the back rooms was Disarm (Guitar) and the bright orange vinyl record on book shelves surrounding the receptionists desk. 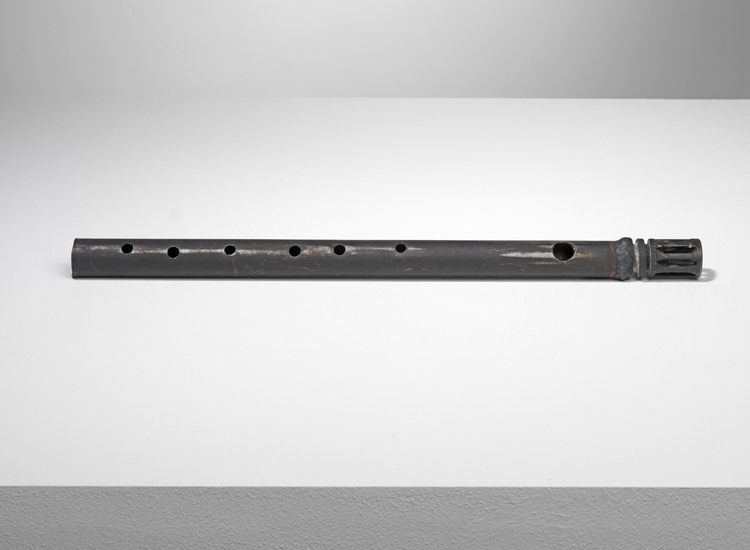 The visitor then encountered a wall covered with bright yellow posters advertising the opening event and the Disarm instruments on custom made shelves. 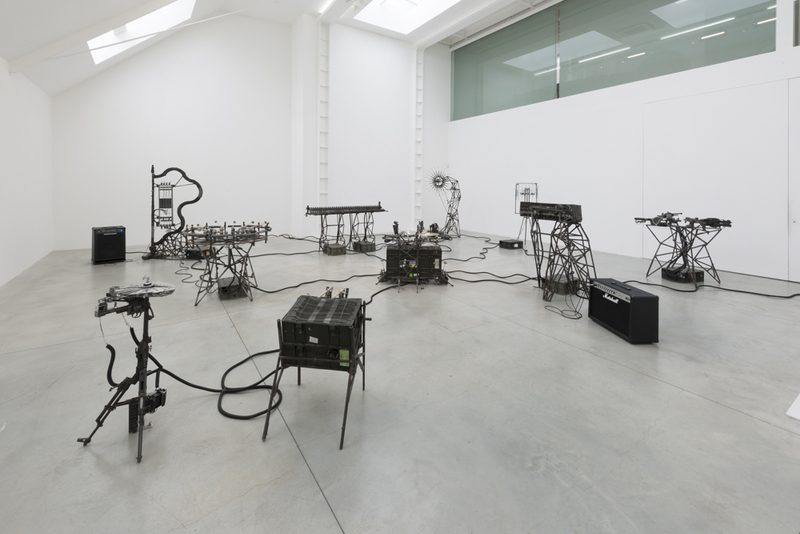 The mechanised Disarm instruments were configured in the main gallery – occupying the space both visually and acoustically. 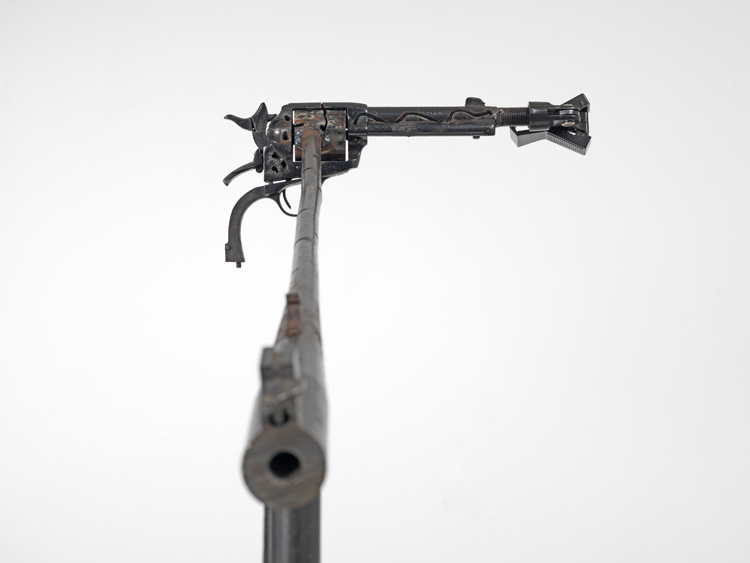 The reaction surrounding the exhibition was tremendous from both the British Press and the visitors.